I have to say that we do have a soft spot for meatballs in our family. We love our real meatballs, made mostly with turkey or beef, sometimes with pork or fish, but not only those. I am happy to say that we love our vegetarian meatballs just as much. I think I am trying a new meatball recipe, either vegetarian or not, at least once a month, probably more frequently, and we love most of them. This one is a new variation that my kids totally loved. We had them two days in a row, stuffed in homemade spelt rolls, smothered in a tangy tomato-bell pepper sauce , topped with mozzarella and grilled in the oven. So filling and satisfying, yet completely wholesome and healthy. 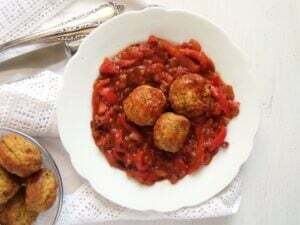 You can have these meatballs with their sauce over a plate of whole wheat or spelt pasta as well, you can put them in a wrap and add some grated cheese or avocado or you can eat them just like that as a small snack in between. I found them delicious either warm or cold. If you have leftover sauce you can have that over pasta or rice or you can smear it on your sandwiches and top it with cheese. DELICIOUS! Cut the slice of bread into cubes, place in the food processor and pulse until you obtain breadcrumbs. Remove and use the food processor to grate the Parmesan and the gouda/cheddar cheese and the vegetables as well. Alternatively you can grate them by hand. Place the fresh breadcrumbs back, add the drained chickpeas, dry breadcrumbs, egg, herbs, salt and pepper and blitz until everything is well mixed. Adjust the taste again, be generous with the salt and pepper and add just a few drops of water if the mixture appears to be too dry. If the mixture is too wet and you cannot form the balls easily, add 1 or 2 extra tablespoons breadcrumbs until you are able to form the balls. Do not add too much extra breadcrumbs, the mixture should be pretty wet. Form the balls, they should be about the size of a golf ball and fit in the mini-muffin pan holes easily. I had 22 balls. 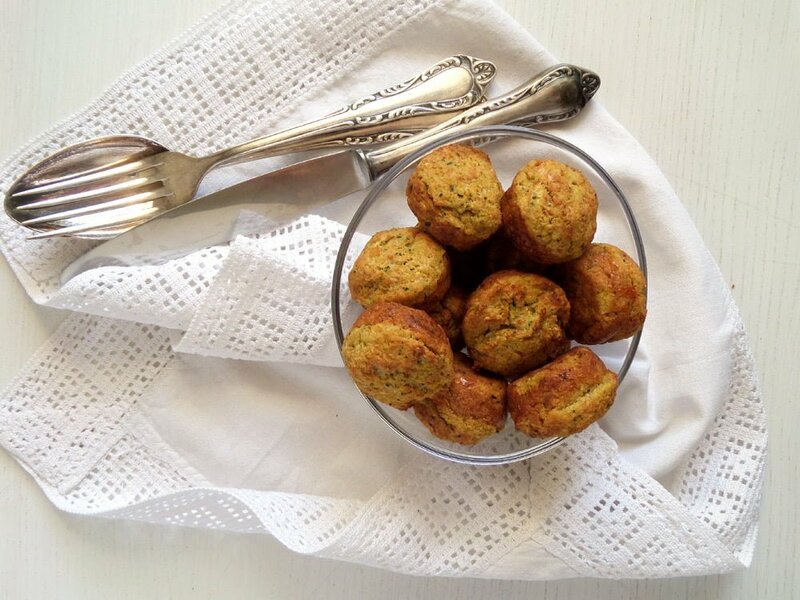 Brush the mini-muffin pan with some olive oil, place the balls inside and bake for about 20 to 25 minutes, until golden brown. Chop the onion and the garlic cloves finely. Slice the bell peppers thinly. Heat the olive oil in a pan, add the onions and cook until lightly golden. Add the garlic and the sliced peppers and cook for about 10 minutes or until soft. Add the sauce, turn the heat down and simmer for about 5 minutes. If you serve this over pasta, add the meatballs to the sauce. 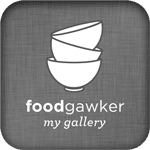 If you serve this in a roll, cut the rolls in two, add some sauce on the lower side of the roll and two or three meatballs, top with some mozzarella slices and put under the hot grill until the cheese starts to melt. Place the upper slice of the roll under the grill as well, so that it gets hot too. 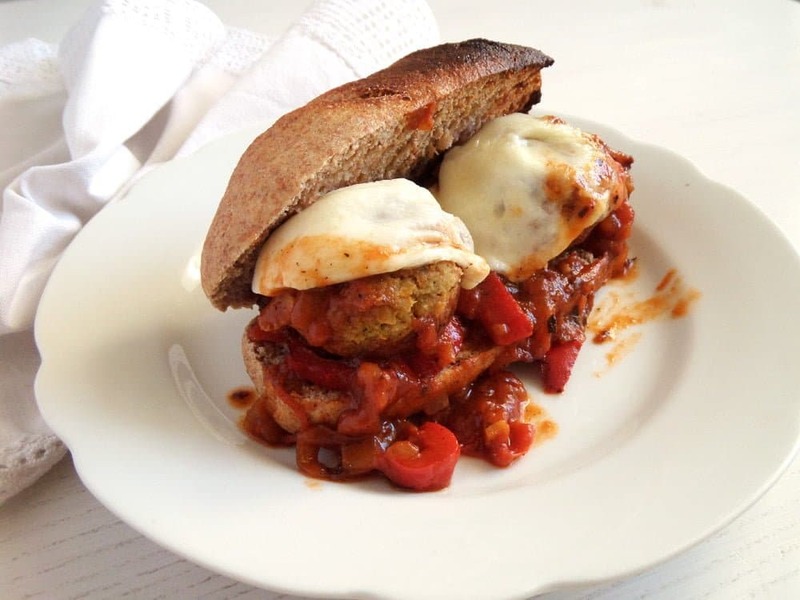 Love these meatless meatballs! I try to eat meatless meals at least once or twice a week, so I love finding recipes like this. And that tomato/bell pepper sauce sounds amazing! 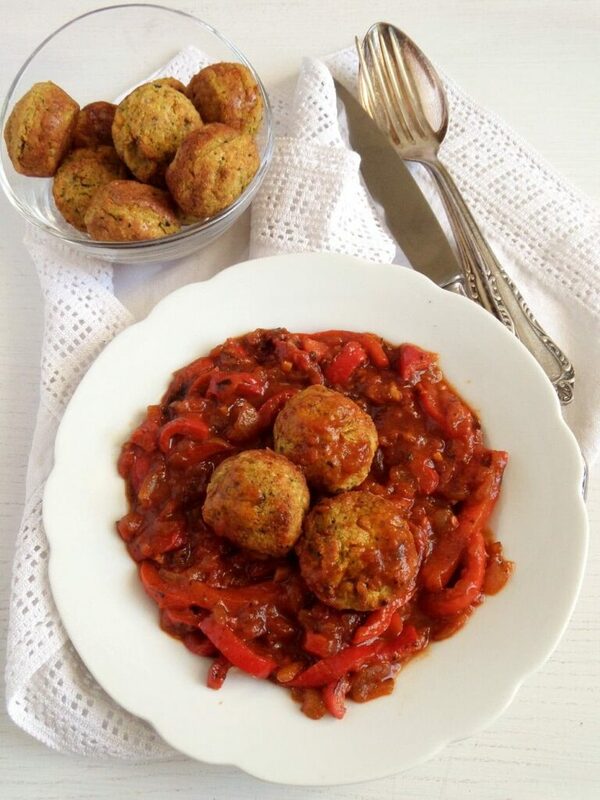 Now I am dying to try some vegetarian meatballs! I eat a lot less meat these days and I know I would love these. I’m not sure I can convince the little one at home but this really looks delicious, with that great sauce. Ooh I love anything with chickpeas! This looks just lovely! I love meatballs, and I bet these veggie ones taste absolutely scrumptious! These vegetarian meatballs look droolworthy! Oooo yummy! These look delicious. Wow! I am so glad, I hope you all like them, I almost feel a bit nervous about it! 🙂 Happy New Year! They were delicious and the recipe was just as easy as advertised! I only had one mini-muffin pan so we used a regular muffin tin for the rest, cooking a few minutes longer. The mini and jumbo veggie meatballs were a big hit with the hubby 🙂 I tossed a few of them in the freezer so we could make pitas this weekend. We will definitely be making them again but first I want to try your recipe for the Broccoli Cauliflower ones!